The end is near for war-weary 3rd Battalion, 5th Marines. Numerous media reports within the last week note that one of the hardest battalion deployments in the history of the nine-year war in Afghanistan will come to a close at some point soon. 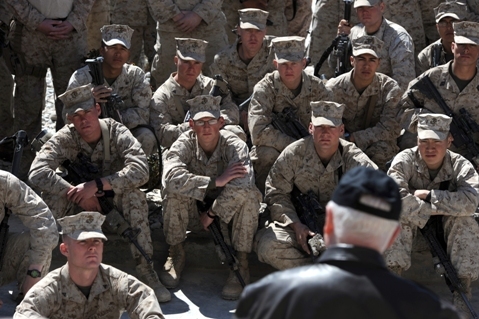 The Camp Pendleton, Calif.-based unit will be replaced by 1st Battalion, 5th Marines, the Los Angeles Times reported. Whether it is words written in a journal or the memory of a friend or something they tuck into their flak jackets before heading into battle, these things they carry in hand or mind have helped the Marines finish what has been a very difficult mission in Sangin. Over at Patrol Base Fires in the violent “green zone” of tree-lined fields flanking the river, Sgt. Philip McCulloch keeps a picture of his girlfriend in his shirt pocket, and a rifle shell from the 21-gun salute that honored his friend Sgt. Jason Peto killed Dec. 8. Along with his own dog tags, one from a buddy who died, and a cross, Lance Cpl. John Torres kept a ring hanging from his neck that his girlfriend gave him before he left Camp Pendleton. He learned she had moved on when he saw a picture of her kissing another man. When Torres got in touch with her he said: “My friends were dying here. I was going through some horrible s*,” and you couldn’t even write me a a Dear John letter? “And my name’s John!” Torres fumed. Now that the girl is gone, he still wears the ring. It’s gotten him through countless firefights alive. Taking it off now might break his luck. But on that last flight out of Sangin, he plans to hurl it out the back of the helicopter. “I’m going to leave it in Afghanistan,” he said. The thought seemed to cheer him. That’s resiliency. We’ll be keeping 3/5 and 1/5 in our thoughts going forward. Come home soon, guys. We’re waiting! God bless each and everyone of you. We appreciate and honor you for your service. thanks dan! brave warriors all of ’em! stay safe 1/5! My Son is coming home. Thank U, Almighty God for protecting him. Job well done, 3/5 Brothers – a tradition upheld – you can stand tall proudly with your brothers from WWi, WWII, Korea, Vietnam and Gulf War I. Welcome Home, Semper Fi and Oorah! Get Some 3/5! Well done. Please come home in peace. You have earned it for us and for yourselves. God Bless the Marines. I was in SOI with Peto and he was a hell of a Marine…RIP brother. Dear 3/5 Marines. I am that mom who headed up the Christmas Card Campaign sending you over 1000 cards this past Christmas. The local high schools, BSA Troops a youth group and more joined to send over 3500 cards to our military. We sent boxes at Christmas and am sending again this Spring, but to the 2/5. The students are so proud of you and thankful for your sacrifice. They were thriled to hear you got their cards. We are so thankful for you and your families who have sacrificed as well to give us the freedoms we have in our country. Our thanks to all of you. We support you and also share your sorrow at those who will not return. How do we ever say thank you enough? Words fail, but I hope the cards encouraged you all through the hard times. I’m the girl who John is talking about…and I don’t even know what to say! Sorry doesn’t even come close to being good enough. But, I want to say sorry anyway. The situation was a little different than what is said here, but I still feel bad about what did happen. John and I are still talking 😉 and I’m not as bitchy as this makes me sound lol. Dear John’s girl….what is 7 months compared to his life? My son had a girl like you. I knew she wasn’t going to see him through this and tried to talk to her. You see, the last thing they need while IEDs and bullets await them is your self-centered actions on their mind and in their way. Grow up, you shouldn’t have sent him off with your ring around his neck if you weren’t going to be able to see him through it. And to John….son, good idea to leave it in Stan, forget about her, there is a gal out there just waiting on you to see her! I respect your response. But I do have to say…we were not dating. The reporter understood wrong and made a story out of it. We were together for a week before he deployed — that is no exaggeration. I knew him from high school and we reconnected when he was on leave over the summer…then when he left, I gave him the ring as a token of luck. Dear John’s girl…glad to hear the “other side” and that you two are still friends. No if that is the way it came down, then I apologize for my comment “a girl like you” that was pretty bad wasn’t it….sorry! My son’s situation was very different. I would cash in on the dinner….but I might make the reporter treat both of us! Best of luck to both of you! Pass on my thanks to John for his service. A friend and I sent multiple packages over there. His friend’s son is a 1Lt in 3/5. We found out after the return stateside that all the packages had made it and they loved them. Good work and thanks from a grateful nation. Does 3/7 have the same address? Dear “Dear John,” this is the reporter who wrote the blog post that mentions Torres. I hope you two can work it out, or have already. Maybe now that you’re in touch again he won’t chuck that ring out the back of the helicopter after all? He’s been through a lot, as they all have in Sangin, so I hope he finds the woman of his dreams. Good luck to both of you.